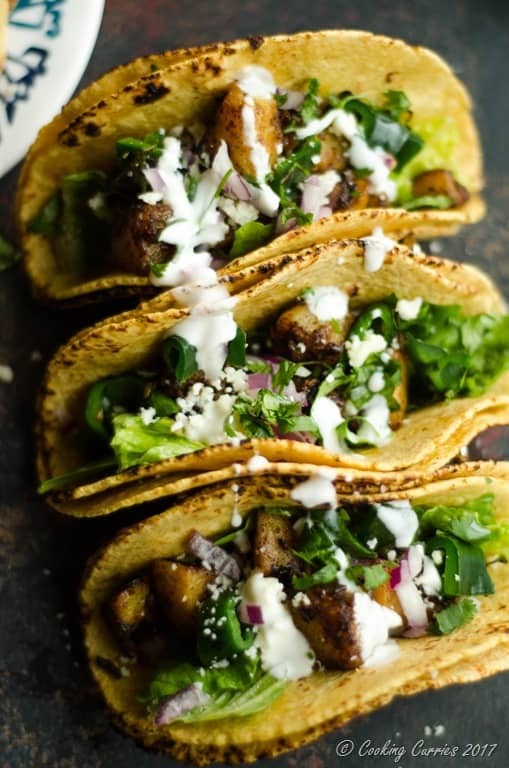 Potato and Roasted Poblano Peppers come together in this feisty and flavorful vegetarian tacos, that will be a great addition to your cinco de Mayo party! It took me a really long time, after I came to this country to like Mexican food. It was tough being a vegetarian, as most vegetarian options was limited to rice and beans and some cheese and pico degallo or guacamole on top. The beans was for the most part not really flavorful at all, at least at the small Mexican restaurants we ate at. And all that I heard about Mexican food being spicy did not hold at all. It was mild at best! I then read up about Mexican cuisine, tried all the various different chillies (and, yes, there are some really spicy ones) and mixed and matched various flavors and got a little inspired from some of the vegetarian dishes at some decently good Mexican restaurants here. 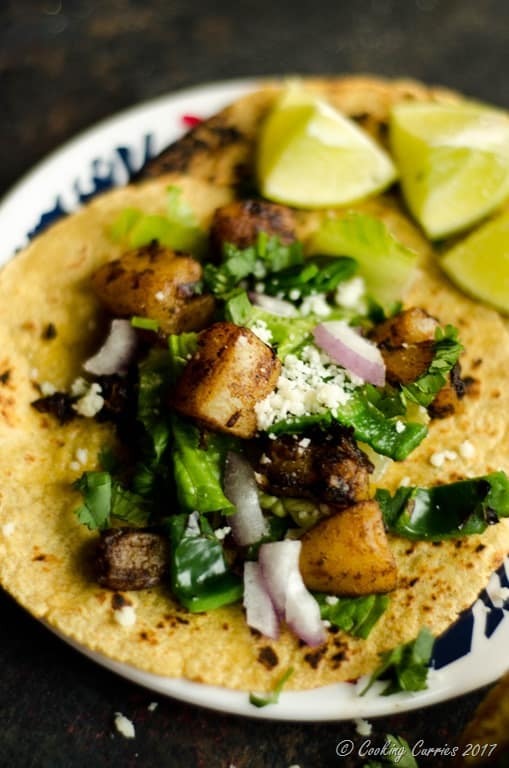 This recipe is very roughly inspired by the Spicy Potato Poblano Tacos of the Cactus Restaurant chain here in Seattle. It is not quite as spicy as the name suggests but is quite flavorful. As I was making some Chorizo Potato Quesadillas for the boys, I suddenly remembered these Potato Tacos from Cactus and decided to make some for myself. I am so glad I did, rather than just making doing with some black beans as taco filler. Even if you are not a vegetarian, you will love this. 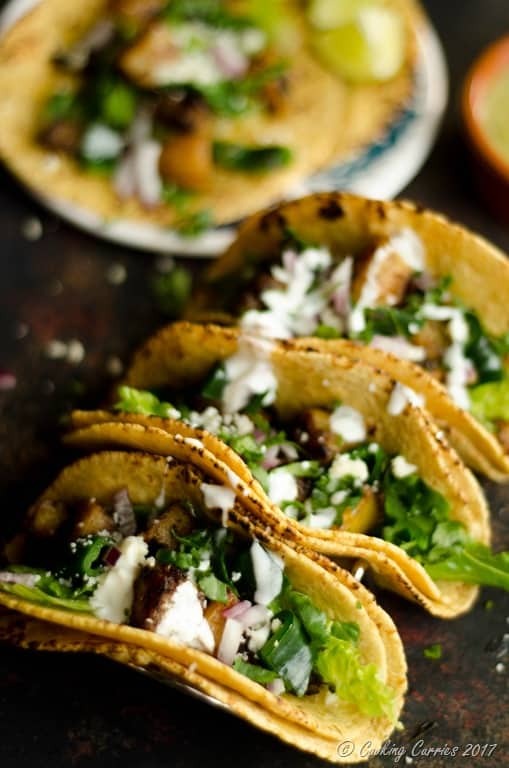 Here are a few other vegetarian taco recipes, that we make quite often here at home! Pair with either this Grilled Pineapple Chili Margaritas or Mango Margaritas with Ginger and Mint. Heat the oil in a skillet and add the onions and garlic to it. Give it a quick stir and add the potatoes to it. Keep it on medium low heat and cover and cook till the potatoes are just soft. Add the ancho chili, cumin and paprika and mix it well. Add salt as well. On an open flame, roast the poblano till charred on the surface. Cut it in half, discard seeds and chop the rest. Add this to the potato mixture. Heat the tortillas in a skillet until soft and give it a quick char directly over the flame (optional). To assemble, stack two tortillas together and place some lettuce leaves on it. Top with the potato poblano mixture and then some of the onions and cotija cheese. Drizzle some sour cream over it. Garnish with cilantro and squeeze a little of the lime over it. These flavors are so perfect and totally up my alley. Poblanos are my favorite Mexican vegetable and work with it all the time. 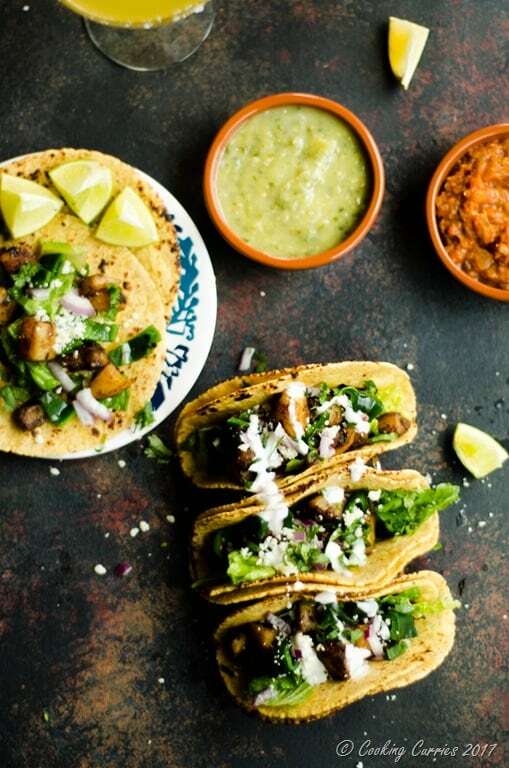 I need to try this vegetarian taco recipe. Oh my gosh! 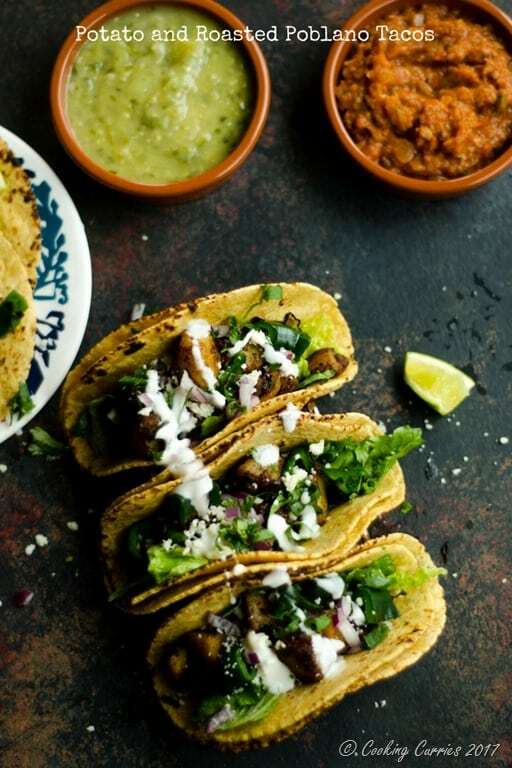 I love this dish, looks amazing and who doesn’t love tacos. O I love roasted poblanos! So much flavor and the right amount of heat! These would be a hit at our house! Love the roasted poblanos! All tho I’m not a vegetarian, I enjoy only vegetable meals. I love how your textures and flavors all balance out in this meatless taco.